You know how, sometimes when you enter a store, you have to walk through it three or four times to make sure you’ve seen everything? No, not like at the grocery store when you’ve forgotten your list…or is that just me? I haven’t been to Quilt Expressions for about a month. An extreme case of withdrawal was taking hold, so I knew it was time for a fabric fix. When I walked in, I discovered that Karen had moved the store around! And new products? Everywhere! I pulled out my camera and started snapping away. Three trips around the store later, here are a few of my favorite new items and projects. 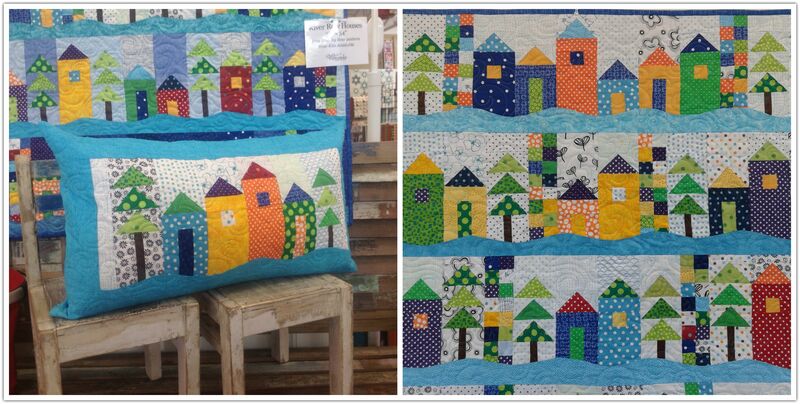 Quilt Expressions’ Row By Row: a celebration of our gorgeous Boise River. If you’ve been spending time on social media, you’re aware of the Row By Row Experience 2015. Imagine a nationwide shop hop that lasts several months. Yeah, it’s kinda awesome. Participating stores have each designed a 9-1/2″ by 36-1/2″ row using this year’s water theme. Patterns are available for free at participating store for walk-in customers only until September 8, 2015. Many shops are also offering kits for in-store purchase. On November 1st, the stores have the option of selling the patterns and kits online. Once you’ve collected eight patterns from eight different stores, you can make a quilt and possibly win a prize! Click here for more information, rules and a list of all participating stores. Quilts, quilts everywhere! 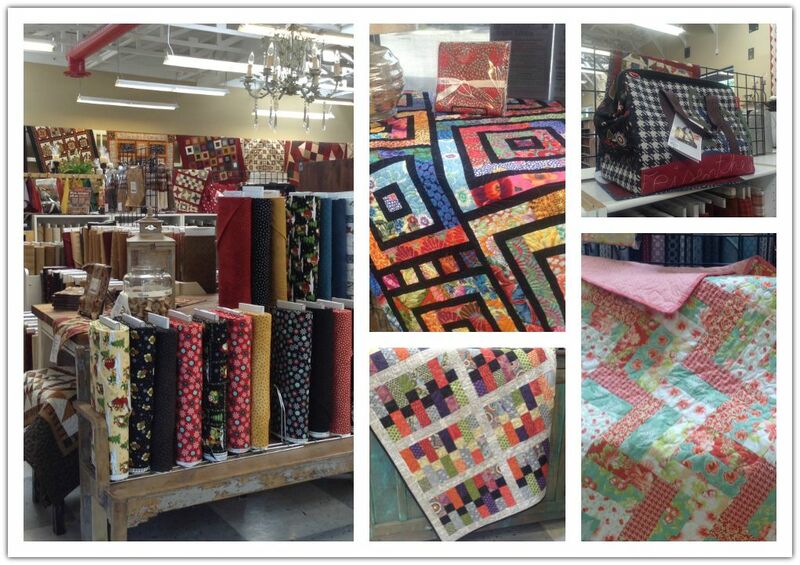 The talented ladies at the store have been busy designing new patterns and making new quilt samples. Every sample is quilted on our Statler long arm machine and bound by one of our experienced employees. Each time I visit, I always spend some time admiring the wool display. We have a large selection of patterns, along with everything needed to complete the projects. I have yet to work with wool, which is probably why I admire the hand work so much. Wool is on my someday “to-do” list, though. New customers, and sometimes even returning customers, often take one step inside the door, stop and just look around. 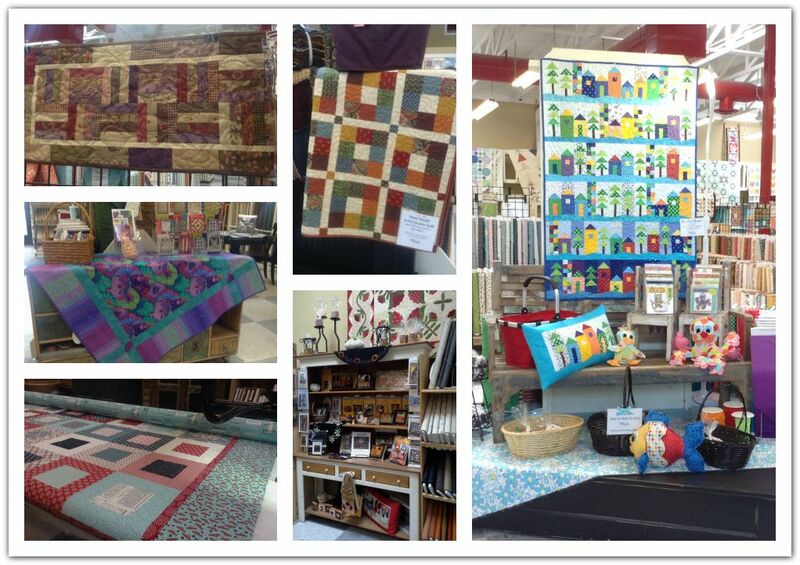 The front display (which is changed often), new fabric collections, quilts hanging around the perimeter of the entire store and on many other surfaces, our original patterns and samples….it’s a feast for the eyes! With the hot summer we’ve had here in Boise, it’s hard to start thinking about the holidays. However, if you like to give handcrafted gifts, you know it’s best to start early! Stop in or look online at our Halloween and winter holiday collections. 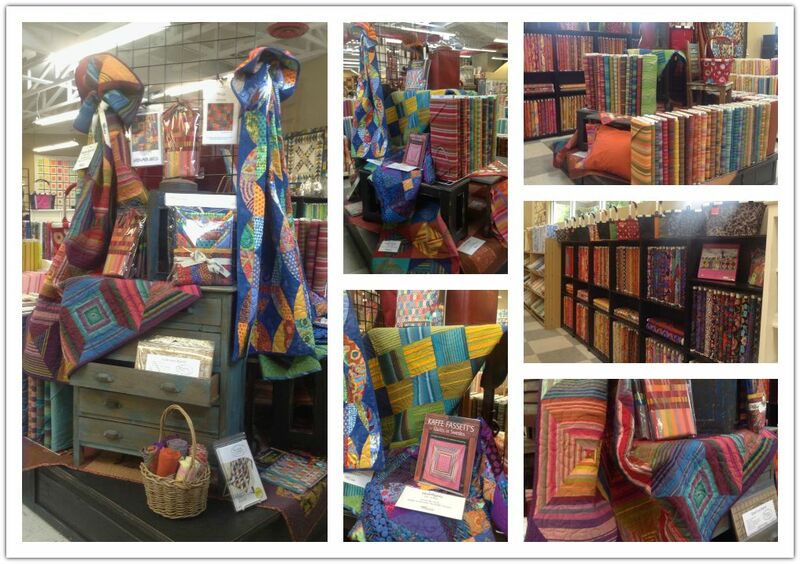 Did you know that Quilt Expressions’ creates and sells original patterns? Click here for our online selection. Stop by the store to see an even larger selection. We’ve been carrying the Reisenthel Market Baskets for quite a while now. They are the perfect carrier for all of your crafting needs. We’ve tried to carry Doctor Bags (shown in photo above), but they sell out as soon as they go on display. Karen placed a large order recently, and, if you hurry, you’ll find the Doctor Bags in stock and at great prices. These bags aren’t available through our online store….just in-store. I hope you’ve enjoyed this short photo tour through the store. Stop in and see us soon!